When The Division 2 hits store shelves March 15, players are going to find the first game’s Dark Zone split into three areas in Washington, D.C. – and that’s just the first of the many substantial changes coming to the game’s lawless PvPvE environment. Now you can see what it looks like in action, thanks to this 15-minute video of raw gameplay footage. Arekkz Gaming attended an Ubisoft-sponsored event to capture the footage, which shows their team of four agents making their way around two of The Division 2’s Dark Zone areas, East and South. Dark Zone East is the area around Union Station, while Dark Zone South is located in Fisherman’s Wharf. Veterans of The Division will instantly recognize the gameplay shown here – it’s unmistakably more of The Division, although the environments are more overgrown and less grid-like than the Manhattan streets of the first game. ISAC, the AI companion who serves as The Division’s in-game guide, amusingly points out landmark after landmark as the players move around in D.C. – they’ll clear out one landmark only for ISAC (who’s still voiced by Brandon Keener, who you may recognize as Garrus Vakarian from Mass Effect) to notice another one nearby. 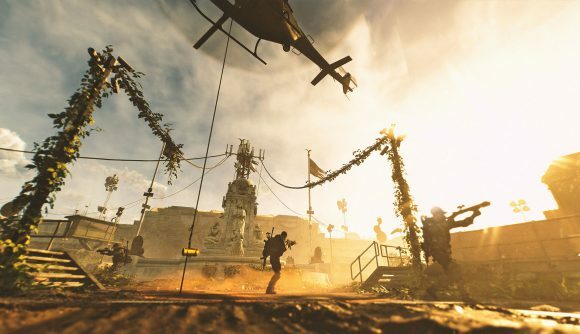 The Division 2 still has its predecessor’s weird bullet-sponge shooting, and if that’s something that put you off the first game, well, it seems largely unchanged. But for fans, there’s plenty to like in the video, including some of the new Agent skills on display. As mentioned above, The Division 2 release date is set for March 15. However, you can get a jump-start on the game by participating in the beta, which runs February 7-11. You can sign up for a chance on an invite, but pre-ordering the game either from Ubisoft or a retailer will guarantee you a chance to play in the early beta.